Pictured (L-R): Missy Wilson, UMPG Sr. Creative Director; Ron Stuve, UMPG VP A&R; Cyndi Forman, UMPG VP, Creative; Ryan Hurd; Kent Earls, EVP/GM, UMPG; Travis Gordon, UMPG Creative Director; attorney Chip Petree of Ritholz Levy. 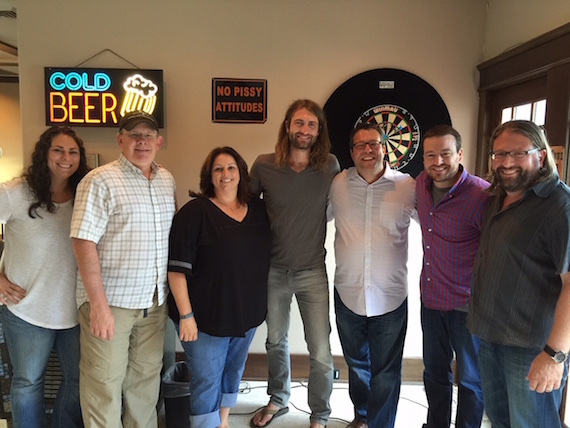 Songwriter Ryan Hurd has extended his exclusive global publishing deal with Universal Music Publishing Group (UMPG) Nashville. Since Hurd signed his first music publishing deal with the company three years ago, he has secured multiple major label cuts and had four singles on Billboard’s Country singles chart, including the No. 1 “Lonely Tonight” by Blake Shelton feat. Ashley Monroe. UMPG will be working to help Hurd pursue a label deal, in addition to supporting his development and reach as a songwriter. Hurd earned a nomination this year for MusicRow‘s prestigious Breakthrough Songwriter of the Year award, and has been collaborating with artists including Jake Owen, Darius Rucker, and Randy Houser. “I love writing for Universal and it is so exciting to continue to work with Kent, Cyndi, and the rest of our team going forward. They are incredible publishers and even better people. It is a privilege to count them as partners in my songwriting and I have no doubt that this is exactly where I am supposed to be,” added Hurd.